Habit: Low shrub < 10 cm, mat-forming, short-hairy. Leaf: +- basal (much reduced distally on stem); main blades 5--30 mm, elliptic to (ob)ovate, (sub)entire, glabrous, green. Inflorescence: glandular; pedicels short. 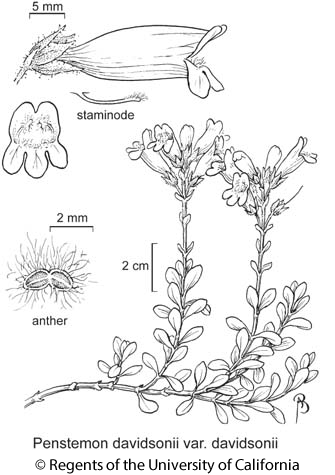 Flower: calyx 7--13 mm, lobes linear to lanceolate; corolla 20--36 mm, blue-violet or blue-purple, floor +- white-shaggy-hairy; anther sacs 0.9--1.3 mm, valves spreading flat, white-woolly; staminode included, densely pale yellow-hairy. Chromosomes: 2n=16. Citation for this treatment: Margriet Wetherwax & Noel H. Holmgren 2012, Penstemon davidsonii var. davidsonii, in Jepson Flora Project (eds.) Jepson eFlora, http://ucjeps.berkeley.edu/eflora/eflora_display.php?tid=63241, accessed on April 22, 2019. KR, CaRH, SNH, Wrn, n SNE (Sweetwater Mtns); Markers link to CCH specimen records. Yellow markers indicate records that may provide evidence for eFlora range revision or may have georeferencing or identification issues. Purple markers indicate specimens collected from a garden, greenhouse, or other non-wild location.